Where is the ! " Where is the ☢ ⚠ ☣ ? View Open Source as a Business. 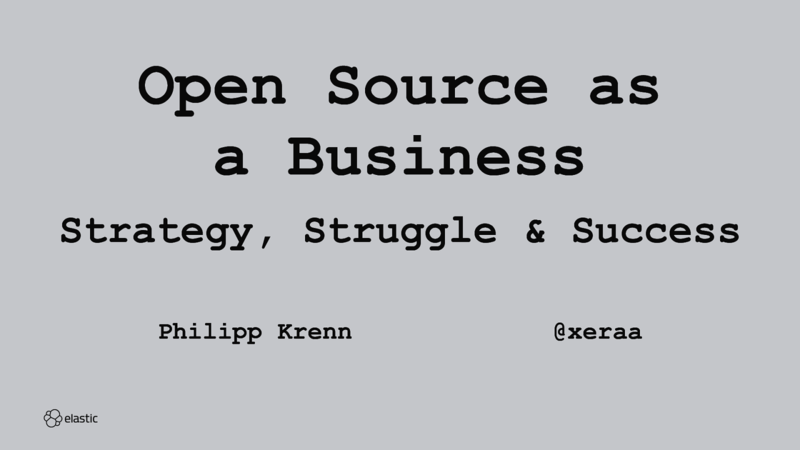 Strategy: How can you monetize your open source product? Is it support, an open core approach, cloud services, or a combination of the three? And which ones are the features you can even commercialize without alienating your community? Struggle: "You received a 100 million dollars in venture capital and yet you have so many open issues?!" Once money is involved the dynamics often change. How can you manage expectations and still build on a flourishing open source community? Success: How do you balance open source and commercial success? How do you align engineering and sales decisions? This talk takes the perspective of Elastic, the company behind the open source products Elasticsearch, Kibana, Beats, and Logstash, which makes its money with support, the commercial X-Pack extensions, and cloud offerings. But we are also taking a look at how others are approaching this challenge, what worked, and what failed. Great talk. I've been researching and think a lot about these topics, so I really appreciate the first-hand insight.